In 1992, we harvested our first two tons of Pinot Noir from four rows atop a knoll in the southwest corner of Carneros. Producing but five barrels, this marked the beginning of Ancien Wines. In the years since, we have continued our pursuit of those rare and special plots where Pinot Noir can rise from great to sublime. We have added to our pursuit of Pinot Noir, the production of its close relative, Pinot Gris, as well as its Burgundian sibling, Chardonnay. For both of these white wines, we closely follow the French artisanal tradition of in-barrel fermentation and aging. Visit us at our winery, located in a little-known pocket of the Napa Valley. Visits to the winery are private and by appointment only. Or visit our convenient tasting room in Downtown Napa, open seven days a week. View from Tasting Room: Taste wine sitting under ancient live oaks, surrounded by vineyards, overlooking the rolling hills of Coombsville. Wine Education: Taste several different Pinot Noirs in order to gain a better understanding of vineyard terroir, or of how where grapes are grown profoundly influences their finished character, about how a fine wine exhibits a sense of place. 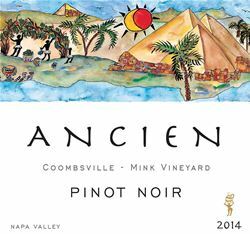 To join the wine club, visit www.ancienwines.com or call 707-255-3908. Vintage after vintage, generation upon generation, our ancestors trained the vine and toiled the soil in a quest to produce wines that lift the spirit and succor the soul. Ancien is our tribute, our homage, to the artistry and passion of these past masters. Their spirit of discovery and their love for the vine and the soil lives on in our quest to discover the finest Pinot Noir vineyards and create wines of singular expression. Join our Quest, and we'll send you a selection of our finest wines, twice a year, with a members-only discount.